Austria, Ferdinand I, AD 1521 to 1564. Silver Groschen. Dated 1548. 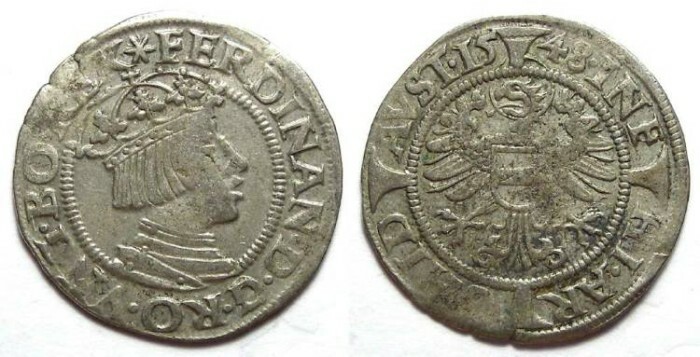 Denomination : Silver Groschen. Date : dated 1548. Size : 20.5 x 21.1 mm. Weight : 2.18 grams. Grade : aVF (minor weak areas). Obverse : Crowned bust of Ferdinand right, with FERDINAN D G RO VNG BO REX around. Reverse : Austrian eagle, with INF HI ARCHD AVST 1548 around.